Meconium aspiration is overhyped as conditions to create MAS (meconium aspiration syndrome) have to be right (or, wrong, as it were) for it to be an issue, and even then the attentive parent will observe problems with their neonate and be able to seek timely medical treatment if necessary. Babies that are being born in a disturbed environment or are experiencing a traumatic birth, particularly via Cesarean, are at greater risk for meconium aspiration. Almost exclusively, full term and post-dates babies are at risk of releasing meconium (not necessarily aspirating, but releasing). This can be stimulated or brought about just from normal stimulation of contractions. Seeing meconium in the fluid should not cause instant alarm and the more easy and natural the birth, and the more time the meconium has had to mix and circulate with the fluids present in baby‘s environment, the less of a threat meconium poses. Aspiration becomes less likely. In one study of babies born with thick meconium-stained fluid, 39 developed MAS and 898 did not. That same publication remarks on an increase in MAS amongst home births and indigenous (minorities) within the population, but this quite possibly has a lot more to do with how individuals are treated than medical and biological predispositions. If the baby passes meconium in utero, it typically mixes with the fluids in the womb. The baby has been practicing swallowing these fluids and the fluids are being replenished. If meconium is fresh and thick and the baby is soon delivered, and the meconium is by or in the airways at that time, this would pose a threat of aspiration. Aspiration may then lead to MAS, and could require medical treatment at that time. A baby having a vaginal birth where the fluids have a better opportunity to be squeezed out of the lungs and airways at birth would have less risk for aspiration and MAS. The baby does not take its first real “breath” until after birth. The baby isn’t breathing in the womb. It “practices” breathing in the womb without actually inhaling. Any aspiration would occur upon delivery. Method of delivery and birth then becomes particularly important in the presence of meconium. This image seems to show meconium already settled into the lungs before the baby has taken a full breath, still in utero. This last quote also indicates how meconium which has had the opportunity to be diluted in or cleansed from the amniotic fluids poses far less a threat to the baby. Birth should not be rushed, and meconium present is not an indication that birth should be hastened. A natural physiological birth is still called for if there are no reasons to suggest the baby is in immediate distress. Remember that meconium itself does not equal distress. That last link indicates that a low APGAR may indicate needing help breathing. This is not always the case. I was transferred for meconium in fluid from my homebirth. My baby was given a lower APGAR score for color. His color was naturally pale and he had no actual complications or health conditions. “In most cases, the outlook is excellent and there are no long-term health effects. This was true for my baby and he was almost immediately returned to me upon inspection. I do not advise automatic hospital transfers at the sight of meconium-stained fluids. Hospital transfer increases risk of trauma from travel, and fear/distress to mother and consequently baby. Fear causes tension in the uterus and deprives organs and fetus of blood and oxygen which increases fetal distress (and meconium release). Emergency efforts are often exaggerated and can be found to exacerbate any issues surrounding meconium (and more). Keeping birth calm and peaceful in a comfortable setting and observing the newborn at birth will be the baby’s best chance of avoiding MAS. I am a lay person. I am a self-educated freebirther (unassisted birther). I have left the medical birth system because I have learned how to make birth safer myself, at home. Therefore, none of this constitutes medical advice– these are my observations and opinions as I continue to grow in knowledge. 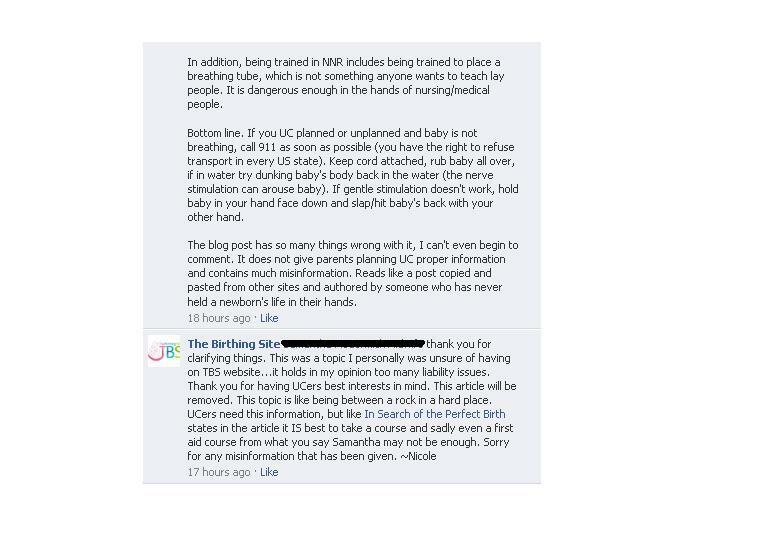 One of the biggest fears when talking about UC (unassisted childbirth) is how to respond to emergency scenarios. A common fear is that the baby will not be breathing or responsive at birth. I believe that having some idea of what you would do in a crisis is extremely important. Not only is it a life saver in the rare event that you face danger, but it’s invaluable for instilling the confidence and peace of mind needed for a truly relaxing birth for you and baby. After all, panic will help no one, even if you are presented with a challenge. Be prepared! So, here are a few things to remember on the topic of neonatal resuscitation. This is not to be construed as medical advice; please research all subjects independently before making any decisions with regard to the health of you and your baby. Babies are instinctively stimulated by mother. You can read more about how mothers tend to do this to illicit a response here in Emergency Childbirth: A Manual, by Gregory J. White. Lisa Barrett (midwife) also remarks, “Rubbing a baby and gently blowing and talking is usually enough to ensure the baby opens her eyes to look and take a breath. There is usually no rush as with a cord pulsing the baby is normally getting plenty of oxygenation and will come into herself pretty soon.” Keeping the baby warm and stimulating it are usually more than enough to achieve positive results. There can be a delay in crying, pinking up, or drawing first breath– don’t panic! The two previously quoted sources also support this and provide elaboration. Aggressive tactics for administering oxygen are no longer generally recommended, and are often not even used amongst the medical community/rescue services. The Lisa Barrett link as well as the Emergency Childbirth text will discuss this more, including how utilizing pure O2 has not been proven better for neonate resuscitation compared with blowing shallow breaths for the infant (this too can be instinctive). In fact, these days, using oxygen on a newborn is considered to do more harm than good and so is foregone in favor of the gentler revival techniques. The International Association for Maternal and Neonatal Health (IAMANEH) also state that an oxygen tank is NOT essential for neonatal resuscitation, that the mask and bag are more appropriate (which is equivalent to shallow mouth-mouth), and even warn against routine suctioning of mouth and nose of infants after delivery. Take action first, dial for help afterward. In an infant CPR video, EMT and Captain Nathan McConnell warns that if your baby needs help, your time is best spent attempting to stimulate and resuscitate. He recommends giving at least 2 minutes of care before stopping to call 911. Precious time could be wasted if you choose to dial emergency services first. By the time they respond and arrive, it could be too late, and since every second counts, immediate attention is key. Since life saving resuscitation techniques tend to be the same both at home and in the hospital, knowing how pros handle it will be critical to making sure you’ve done just as they would, and that you’ve done all that you can do. IAMANEH details the appropriate steps to neonatal resuscitation and speak on it very practically. Basically the steps (see all the links and sources) involve stimulation of the infant, clearing the airways, breathing for the infant, gentle chest compressions, and repeating. Signs the resuscitation was successful include pinking of the tongue (lips alone are not indicative), overall raised APGAR scores, good pulse and good breathing. Resuscitation efforts can go on for up to 10 minutes or more, and 10-20 minutes is usually the period where further attempts would prove futile. Finally, understand that the majority of the time, everything is just fine. The odds of you having to do any of this are slim. Knowledge of neonatal resuscitation techniques can be there for you just in case. You need to learn them, know them, get familiar and comfortable with them, keep cheat sheets, and then put it out of your mind. Don’t dwell on a negative potential… focus your attention on the actual reality and remain calm and optimistic. You have every reason to believe that birth will go smoothly, so don’t worry yourself sick (it only distresses the baby and increases the chances for dilemmas). Nothing beats taking a class. If you’re like me, you have taken a class several years back and even been certified, but keeping current could be beneficial for both increasing your confidence as well as hearing the updated recommendations (as these change from time to time). Hear what the pros have to say, and if possible, get certified. If you’re unsure of your ability to react quickly in an emergency, do drills. Include everyone you think will be present at the birth. Think of all possible scenarios and outcomes. Have Plans A, B, and C.
Like I usually say– even if you don’t plan on having a UC, being as prepared as you would need to be to have one is such a good idea, because you never know where you’ll find yourself and what will happen. Accidental UC’s happen all the time, and mothers who weren’t expecting it and were not prepared experience worse outcomes than intentional UCs that were thought out in advance. When it comes to birth and nerves, education is key. Never hesitate to transfer to a hospital if you suspect something is amiss with your neonate and they do not appear to be thriving. It’s always better safe than sorry. 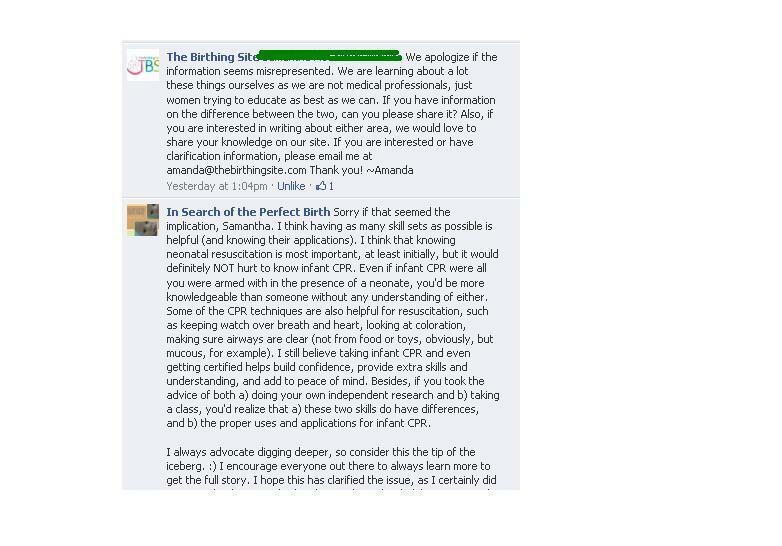 My article on Neonatal Resuscitation was removed from The Birthing Site because one midwife took issue. 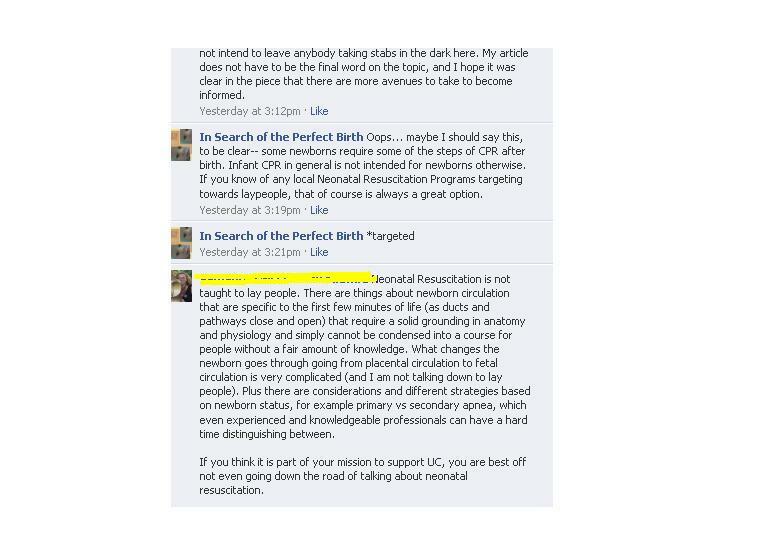 Her argument is that laypeople cannot learn neonatal resuscitation. I knew when I discussed with TBS about potentially writing for this subject that this particular topic was touchy. I asked them first. I let them know my intentions. I knew I was too much for people, not for everyone’s palate, and I knew that there could even be some concerns about liability surrounding this. Yet, I was enthusiastically received, published, and was praised both by them and other sites and members for writing a great article. People said it was helpful. It only took one professional to say “Nuh uh uh!” to have the information hurriedly snatched back, amidst apologies and thanks for their expert valid opinion. Well, I’m not sorry. I did nothing wrong. I won’t apologize for writing it, and I won’t keep it from you. I will publish it again here. Look for the follow up to this piece. Things in life sometimes ARE complicated. Our digestive system is complicated, yet we eat every day. Our nervous system is intricate, yet most of us move daily. Most things in life are a paradox, both simple and complex. Birth is one of those things. 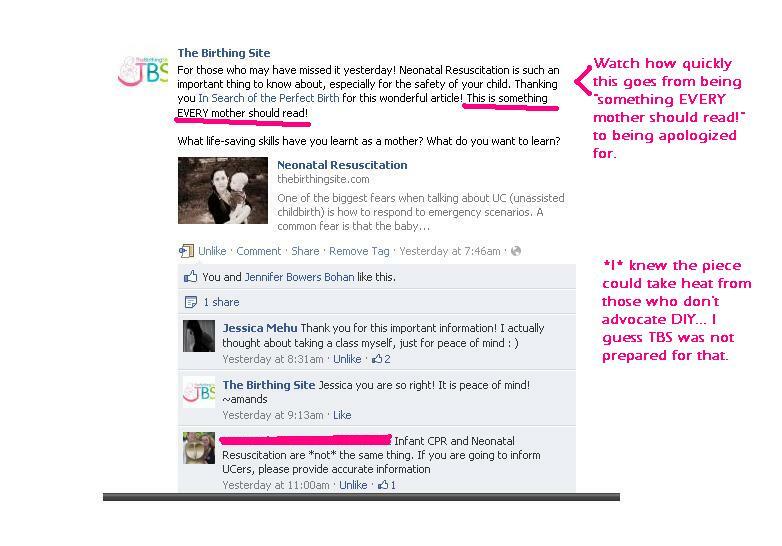 Neonatal resuscitation can be one of those things. There are probably 1 million and 1 things to know and learn about it, yet birth and resuscitation happens every day all over the world and largely without fuss. We need to find the balance between the intricate and the simple. The confidence to flow with the simplicity of nature, and appreciation for the complexity — we re-educate ourselves in an effort to regain the confidence stolen from us by the established businesses who hold authority over our heads. With it, they control our very life and death. I don’t know about you, but I’d like a little knowledge and a little say in that. You can’t censor information. You can’t burn books, even if you’re afraid of what the commoners might think they’ve learned from it all. People in authority think information is dangerous. That’s the story of humanity. Choices and freedom are still for us to have. No one can “let” you do anything. 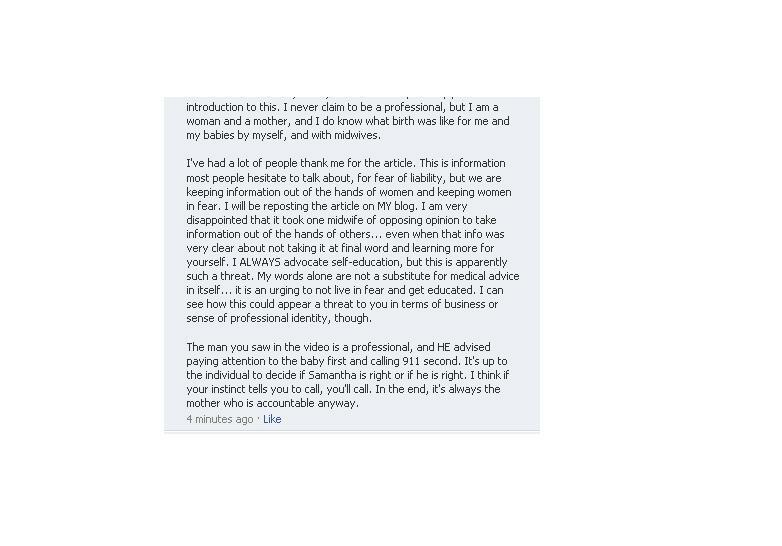 You have the right to birth your way, and you have the right to read my article. What you do with that will always be your final choice. You are in control. The facts are this: Most mothers who feel the need to stimulate a response from baby achieve this naturally and with ease, unless someone has given them fears to hold, fears that they won’t know what to do, that they aren’t good enough to handle it on their own. That panic leads to death. Not being calm, irrational hesitation on your part leads to death. Not knowing when to call for outside help leads to death. Letting their fears contaminate your mental space is a graver danger than birthing without assistance. Take back your power, think for yourself, and live. I was the "liker" there, btw. Now she's talking about breathing tubes? These are not a normal aspect of neonatal resuscitation. This woman is a midwife. I was not aware that midwives were trained and skilled with intubation. It is not recommended that people utllize intubation who are not skilled at doing it very regularly, since it can injure the throat (especially so for a neonate!). 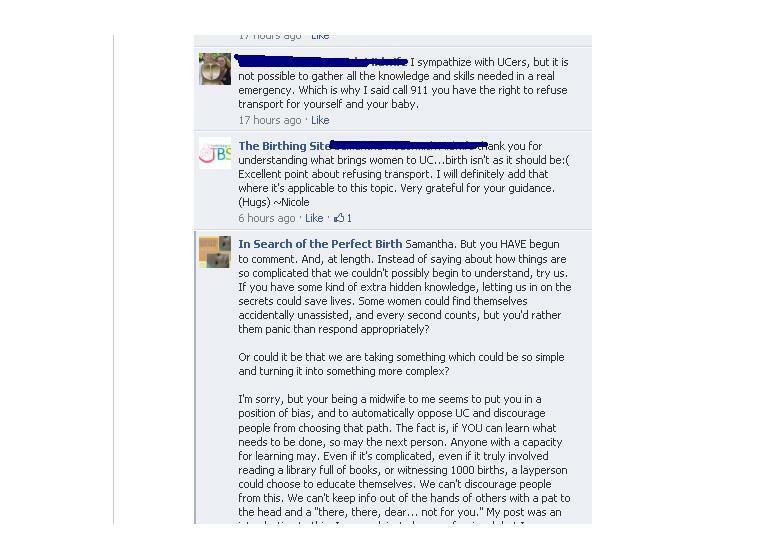 She is not making a case against UC, she is making a case against home birth. I’ve read Samantha’s comments again and had this to add: so much of what she is saying to do to stimulate the newborn is exactly what I am talking about (for example, rubbing). She and I are on the same page there. I am not sure how her info there is better or contrary to mine… it’s not. It’s in harmony with mine. It terms of some things I found insulting… looks like a copy paste job? No, I wrote it all. I wrote it myself. That’s pretty inflammatory. That sounds accusatory. These are MY words. Never held a life in my hands? What on earth does that mean? I’ve been responsible for three newborn lives in my lifetime, the last of which was MY own UC. Of course I’ve held the life of a newborn in my hands! I would argue that every mother has. So, I stand by my work, my good intentions, etc. Samantha having “UCers best interests at heart”? She is discouraging learning more. I am advocating it. She sympathizes with UCers. I am one. She’s a midwife who believes she is necessary. I believe you can DIY. I don’t think having their best interests at heart quite fits. And this, my dears, is how one single person with a title after their name can silence others using fear.